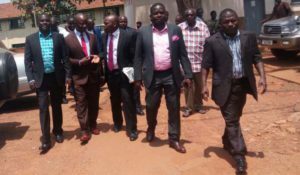 Suspended MPs arrive at Kibuli Police headquarters. Photo by Raymond Mayanja. KAMPALA–By lunch time, 25 legislators who were suspended from Parliament yesterday for indiscipline have appeared before CID Police, Kibuli. The 25 MPs mainly from the Opposition parties were forcefully evicted from Parliament by the security agents. They were summoned to Police to make statement. The 25 MPs were fighting the move to bring the motion, allowing to discuss amending Article 102(b) of the Constitution, to lift the age limit. Those who were seen at CID Police Kibuli at lunch time are Winnie Kiiza (Leader of Opposition), Ibrahim Semujju Nganda, Medard Segona, Mathias Mpuuga, Monica Amoding, Barnabas Tinkasiimire, William Nzoghu, Joy Atim, Jonathan Odur and Peter Okot. Others like Vincent Niwagaba, the shadow Attorney general, has been charged with assaulting the Prime Minister, Dr Ruhakana Rugunda while Theodore Ssekikubo is facing accusations of inciting violence in Parliament. Speaker Rebecca Kadaga suspended the legislators for three sittings and they have to pay damages for the things destroyed during the fighting. The fracas broke out after refusing to vacate and the security agents came in. In the process of resisting to vacate the House, MPs resorted to exchanging blows with the security agents. During the fracas, some MPs were seen standing on the tables. Loud speakers and stands were destroyed. Some legislators fainted during the fracas and were rushed to the hospitals. 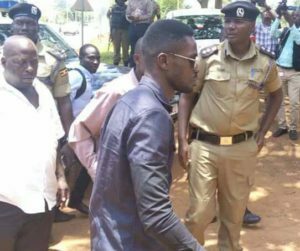 Bobi Wine arrives at Kibuli Police headquarters. Photo by Raymond Mayanja. Opposition MPs are threatening not to go back to Parliament or handle any Parliamentary business. Ssekikubo has threatened to take legal action against SFC, accusing them of assaulting MPs. Ssekikubo said they will sue individuals but not the institution. But SFC denied to have been involved in arresting legislators. Meanwhile, Kampala Lord Mayor Erias Lukwago has this morning paid a courtesy call to Mityana Municipality MP Francis Zaake Butebi, who is among the legislators injured during yesterday’s scuffle and went into comma. Angelina Osege, the Soroti District Woman MP, was also seriously assaulted by the arresting security operatives.